Rewind back to the dawn of fall 2012, you are looking at the fall 2012 anime chart, and you pick probably 5-7 anime you are going to watch. But I can promise that the majority of you, as did I, most likely did not have Shinsekai Yori as a pick. During midst of 2013 I looked at Shinsekai Yori, the promotional picture did not catch my eye and the premises did not spark my interests. However, I did give it a shot and after finishing the anime I can promise that it is truly a spectacle, a diamond in the ruff. The story takes place in Japan a thousand years from the present in a utopia where a portion of the population retain a special power called psychokinesis. From the beginning we follow a group of five children as they grow up in the anime and see how they develop within a community bounded by strict rules, and deal with the decisions they make that alter the course of their lives and the entire society they live in. The plot of the show flows very nicely from episode to episode and just as we approach the climax, there’s a plot twist and the storyline from that point just flips upside down in a way you would never expect it to. The characters in this anime are just something else, with Saki as it’s shining star. The main characters start off as children and by the end of the anime they are adults, with proper illustration of character development. There are a couple of anime who have attempted this children to adulthood metamorphosis motif within one season but they do not pull it off as well as Shinsekai Yori. With an anime that has twenty-five episodes, you would think it would not be enough time for proper character development from children to adults. However, Shinsekai Yori pulls this off very smoothly, which is evidently seen with Saki and Satoru, which even applies to the supporting characters as well. You will not see one character behaving as such and then the next episode they are being the polar opposite, everything is explained and shown very well. The sound is one of the areas this anime excels in. Every sound that you would not even care for is implemented in every episode and added in the appropriate places, at the appropriate times; the echoing of the voices in a dim room, the rippling of water flowing from a stream. Not to mention soundtrack produced in this amine, which is amazing. Just youtube the battle theme, even if you have not watched the anime yet, it will entice your interests in this anime. The quality of the art and the animation is what you would expect of any anime standards that are out there today: clear, crisp and pleasing to the eye. The characters and the environment in each of the scenes are drawn to a level of detail, not too simple, yet not to far in detail as well, just in the middle. The quality of art really makes you focus on the message the anime is trying to radiate to the viewer; more than focusing of the wow factor on how amazing the art is. In terms of the enjoyment, this is not an anime that starts off on a high note and continues as such from there. The first two or three episodes really butters you up, but once you hit the fourth or fifth episode, I promise you, you will be hooked and you will just watch one episode after another. Even if you are more into romance, comedy, action or any genre that is not related to Shinsekai Yori, this anime is definitely worth watching and will probably open the doors to other anime series you never bothered to watch. Overall I really enjoyed this anime, people should give it a try (unexpectedly, it even became one of my favourites). It did not look appealing to me at first, hence “diamond in the ruff”, but once I started and things picked up, I just wrapped myself in a blanket and marathon’d the whole show. Just looking back at the anime, I will say that one of the highlights of this show is it's ability to take the morals and values of the world we live in and put it into perspective from watching what the characters do to each other and the outcomes that blossom from their decisions. Give Shinsekai Yori a try and you will see what I mean! I hope you enjoyed my seemingly short review, I would not mind any feedback and if you enjoyed this series or feel enticed to watch it after reading this, feel free to leave a comment ! Little inspection into the dystopia genre is required to realise that the majority of the dystopic anime are set in a cyberpunk universe. Be it Psycho Pass, Ergo Proxy or Texhnolyze, the average viewer is likely to have seen these "hi-tech" interpretations of future societies. Enter Shinsekai Yori – a series where whose setting is uncannily quaint such that on first glance, it is hard to see it as a dystopia; but it is, and an exceptionally remarkable one indeed. What distinguishes Shinsekai Yori from its counterparts is the sheer unorthodoxy of its universe. It is one where the modern society as we know it has not been replaced by a technologically advanced civilisation but that of a small picturesque town characterised by a community whose lifestyles have regressed into that of villagers. It is within these bounds that we follow our protagonists from the ages of 12 to 26 in this insidiously deceptive world. Throughout the series, Shinsekai Yori’s universe is constantly developed with fascinating conceptions such as the Karma Demons, Cantus and the Queerats (an entirely different yet intelligent species) that all bring into question many of our humanity’s morals and beliefs. Each concept is thoroughly explored and reinforce each other to create a powerful and fascinating dystopia whose elements successfully examines and challenges the philosophies we take for granted. Despite its complexity, it does not lazily “narrate” the ideologies that we question. You won't be sitting through monologues of lecture-like philosophy or psychology. You see society being critiqued through the journey and consequences of the actions of our protagonists. This is what I find to be the most impressive aspect of the show because Shinsekai Yori fully takes advantage of anime as a medium - a feat that I feel is rare in this genre. The characters' dialogue exist to explore their mind whilst it is their actions and interactions with this post-apocalyptic world that we explore humanity. 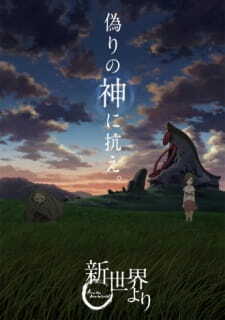 In order to truly appreciate Shinsekai Yori, it has to be completed as only then will the experience be complete as the show's construction of its world is careful to convey certain messages and hidden meanings throughout the show allowing viewers to formulate and reformulate key ideas and questions without ever stooping to overbearing narration. The characters in Shinsekai Yori all play crucial elements to our story and the range of our cast fully captures the countless perspectives that people in such a world can hold. They are all effectively portrayed via their interactions which unravels how multi-dimensional they are. These interactions are genuine and there is an excellent balance between dialogue, silence and narration from our female lead Saki whose voice actor must be praised for such an alluring performance. Despite the show’s timespan ranging from our protagonists’ youth to their adulthood, the pacing is impeccable as it changes from a slower pace to accommodate the universe-building to a faster pace needed to match the gravity of the conflicts that occur. For an immense dystopia, it only makes sense for it to be accompanied with diverse artwork. As we observe their world throughout the seasons and its numerous settings – oceans, mountains, villages both desolate and populated, they are portrayed with their own unique environment and colour choices. This is all contrasted with the use of experimental visuals and cinematography during the more dream-like and ethereal scenes which do not exist to simply invoke awe but contribute to subtly send hints across to the viewer on certain mysteries and foreshadowing certain events. Complementing the visuals is a soundtrack which encapsulates the essence of the show with each track strengthening the visuals and enhancing the overall experience. The soundtrack demonstrates how effectively music can make emotions across the human spectrum more compelling whilst respecting its role of being a supplement to the show and thus maintains our focus on the story the series presents - one which no extent of audiovisuals is required to make its ideas any more resounding than they already are. All in all, Shinsekai Yori is a series that delivers in every single aspect it aims to explore. It displays enough to connect all the ideas examined together into a singular full dystopia but leaves enough for viewers to intellectually ponder and elaborate for themselves. It is profound yet not pretentious and examines humanity without falling into a safety net of tropes that may suffice the viewer but do not inspire. Unlike many of its counterparts, Shinsekai Yori is not a dystopia that relies on a singular premise but a whole host of powerful conceptions that coalesce to create, not just a society, but an entire universe. It achieves this with excellence and elegantly provides us with the most wholesome and meticulously crafted package of dystopian fiction I have ever seen and I unhesitatingly recommend it to anyone who seeks the same. Shinsekai Yori was that show where I could sit in awe watching the director roll out things one after the other making it look so very effortless. As a matter of fact, I wouldn't bat an eye if the writer actually happens to be from the future because his description of the ‘New World’ is not only persuasive but also connected. The story is set in the future [1000 years from now] where mankind has created themselves an utopia, though the events are restricted to only Japan. It follows the students of a certain batch in a certain school that helps the students master their PK[Psychokinesis] ability aka Cantus. In this period, PK users[humans] are the dominant species and Queerats are their sub-ordinates or slaves and often address the former as Kami-sama[literally translating as 'God']. We follow Watanabe Saki and her friends through the sufferings and pain they endure as they try to unravel the origin and possibly vile past of their present society. The synopsis and the first episode speaks a little to nothing about what the anime truly aims to deliver but the intro of 1 minute[First episode] was enough to keep me reeled in. Fourth episode was bewildering, I had to watch it twice to get most of what was being explained. There was also a portion that temporarily lost my attention and then there was the conclusion that meticulously sealed off the deal on this beautiful creation. Fantasy toned genres never piqued much of my interest but the whole future setting here was surprisingly compelling. Even the plot holes get over shadowed by an unbelievably smooth story transition. One could almost relate our world with the ugly facade put up by the otherwise apparent dystopia. I am deliberately refraining from describing the story but I assure you it's a staggering watch indeed. Whenever I thought- this is it, this is the writer’s limit of imagination, the show would prove me wrong. This is not purely SF or Fantasy, bring in a darker theme, an ingenious screenplay and Shinsekai Yori is born. Shinsekai Yori does contain violence/blood and profanity saturated at some parts of the show. The happenings and revelations in this series can be depressing hence should not be mistaken as a light watch. Shinsekai Yori impressively manages to portray the discriminatory nature in us humans in a completely unorthodox thought provoking manner. Story becomes pretty linear after 6th or 7th episode, but that doesn't stop it from keeping you at the edge of your seat especially near the end. I still can't commend the writer enough for the conclusion he’s given to this work. Best possible ending, as far as it concerns me. As for the Homosexual sequences[very little amount of Shounen Ai and perhaps a little Shoujo Ai/Yuri, 1-2 Episodes tops], it saddens me deeply to see people dropping Shinsekai Yori because of the same. I believe they play a tiny yet essential part in describing the re-casted lives of humans of their time and do not qualify enough for a reason to drop this series. The character designs can be hard to get used to for many, but I've come to realize how much it suits the whole 'Shinsekai' module of the show. A1 pictures out stood themselves again in the Backgrounds Dept. The backgrounds are extremely gorgeous to look at; effects and animation are well above mediocre. Just wow to all the creatures we encounter other than humans and queerats. The color selection fit perfectly and beautifully brings the New World concept to life. Indubitably deserves to be watched in 720p or more. Sound- Bravo! It blends so well into the setting and environment that I couldn't help being mesmerized by it. The BGMs & OSTs were captivating and spot on almost entirely. A custom version of ‘Going Home’ [adapted from the second movement of Symphony No. 9 (Dvořák)] featured earlier in Mawaru Penguindrum was used in Shinsekai Yori, and for me it worked magic in the latter. I remember watching the first episode again and again just to hear that and the first ED 'Wareta Ringo'. Voice actors did an incredible job, I don't know how but Hanazawa Kana-san's voice always gets me. I personally enjoyed Shinsekai Yori way more than I'd initially expected. The entire run had a consistent dark atmosphere, which contributed in keeping the tension. I haven’t been this satisfied with an ending in a long time. This is unquestionably a rare gem among the current trend in Japanese animation industry and is not something one should overlook. Sure there are downfalls like the slow pace in initial episodes, few dry episodes in the middle, minuscule amount of homosexual themes that can irrationally put some viewers off, perhaps some sloppy facial animation now and then, but in the bigger picture Shinsekai Yori more than makes up for the flaws and to me it's no less than something close to masterpiece. That being said, Shinsekai Yori is not a show for everyone but do try it and decide for yourself. Thank you for reading the entire heap. Feedback greatly appreciated. Shinsekai yori is truly a great series. I've been wanting to write this review for a long time but I decided to wait until the series finished to do so as to write an accurate and coherent review as possible. After 6 months and 25 wonderful episodes, here it is. I will do my best to keep this review spoiler free. Adapted of the novel by Kishi Yūsuke, Shinsekai Yori tells a story of a civilisation set one thousand years in the future. Mankind has evolved into beings capable of a obscure power known as "Juryoku" or Cantus, a powerful psychic power that makes the impossible possible. In this new world, Man has neither need nor want for technology and reigns supreme over the New World's indigenous species called Bakenezumi and other new organisms we come across as the story unfolds. All seems well and peaceful in the Utopia man has created for itself, however, as our main characters learn early on in the story, Man's evolution came at a price and the New World's mysterious history is written in blood and hidden in secrecy. Interestingly enough, this series, despite its utter brilliance across the board, has been overlooked by many and is appreciated by few, which is unfortunate as this underrated gem outshines any other series of its season by far in terms of story, characters and execution. Not only is the story of Shinsekai yori highly ambitious, it is intelligent and thought provoking in many ways. Each episode, especially after episode 4, is both thrilling and captivating to the point you simply would not, or better yet, could not view this series one episode one at a time if you had the option not to. Despite its initial appearance, Shinsekai yori is most definitely not a show for kids; be prepared for a lot of death and gore, deceit and some adult themes. The story requires a great deal of critical thinking to coherently understand and appreciate the narrative. I found myself confused several times early on in the series though the plot later on becomes more linear and thus easier to comprehend. Shinsekai yori is a story that addresses inequality and the flaws of the human condition. It shows us the sinister side of absolute control, the price of secrecy and the perils of curiosity. Undoubtedly, Shinsekai yori tells an intense and utterly satisfying story that will leave you on the edge of your seat and wanting more with each passing episode. The characters featured, both the humans and the Bakenezumi are both compelling and likeable. The main characters prove to be intelligent and very inquisitive but are far from perfect as each have intriguing characteristics that defines them with such subtlety and grace I must commend the author, Kishi Yūsuke, for weaving their personas into the story without making it overly obvious and distracting from the plot. It is my fear that diving in any further in the story and characters would simply ruin the experience and thus I will leave it at that. It may interest you that the title name of Shinsekai yori, From the New World in English, was taken from famous Czech composer Antonin Dvorak's Ninth Symphony, written in 1893. I find this to be incredibly fitting as we find out the world set a thousand years in the future is indeed a New World in its own right. Moving on, the art is somewhat unusual but fitting for an unusual story, more so than any other art style I can think of. Though not much attention is given to detail as far as facial characteristics go, it beautifully depicts the scenery and maintains an overall cleanliness to it anyone ought to be able to appreciate. Truly, it is beyond my ability to describe the fascinating world of Shinsekai yori but I would wager it is unlike anything you have likely seen; before. A1 Pictures has done this series justice in its world building, using just the right colours and shading to create a perfect blend that is both visually pleasing for the average viewer and stays true to the story's setting. The studio has done an above average job the majority of the time with the animation, slipping up only occasionally and consistently producing quality episodes. It is worth nothing that there are some scenes - quite a few actually, that are absolutely breath taking in their beauty. And of course this is only augmented by the angelic scores that play at just the right time, at just the right pitch to deliver a powerful trifecta performance of story, art and sound in an astonishing meld. I absolutely enjoyed this series. For 6 months this was the one show I looked forward to the most on a regular basis. While it may have a slow start, after the first three episodes the story takes an sharp turn into awesomeness and intensity comparable to a thriller movie. Having said that, there is something to be said for lack of closure on a rather important element in the story towards the end, which unfortunately is left up to the viewer's imagination and some other nuances, but aside from that, it was overall very satisfying and well worth the watch. While not perfect, Shinsekai yori still remains a masterpiece in my eyes, and so my final score is a 10 out 10. Ten quotes which are sure to have you either reaching for the tissue box or rolling around on the ground with "feels".